Since its creation in the 1920s, the pogo stick has been an image of childhood nostalgia and a niche tool for extreme sport junkies. These days you can get simple pogo sticks designed for children and hi-tech tools to take you to record heights, while getting in a healthy amount of exercise on the side! This guide will take you through the best pogo sticks on the market, their makers, and the history of this unique toy, which captured America’s imagination and has made the rounds from the Ziegfeld Follies in the 20’s to the extreme Pogopalooza competition today. FOAM COVERED METAL FRAME- This Flybar Pogostick features a fully enclosed spring that's surrounded by a foam wrapped metal frame. The soft foam material offers a really cool look while also providing protection of your child and the pogo stick itself. 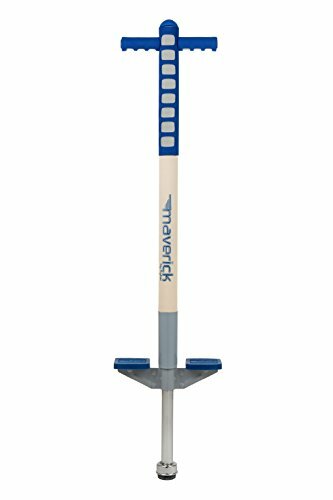 If you’re looking for a simple, classic pogo stick to introduce your children to a piece of your own childhood (or start preparing for their future Xpogo career), the Flybar Foam Maverick is the highest quality pogo stick on the market. This is the only pogo stick on this list that’s designed for younger children. It features textured, non-slip foot pads and easy grip handles, as well as a wider bounce tip (the bit covering the bottom), to keep your child safe. The sturdy metal frame and spring are covered in foam to protect both the pogo stick and your child from the occasional tumble. It’s a great stick for learning the basics and getting your kids hooked on the classic pogo experience. They’ll have so much fun, they won’t even realize they’re getting a great workout and staying healthy. The Maverick is 37.5 inches tall and weighs just under 5 pounds. It’s designed for children age 5 and up, between 40-80 pounds. It is available for a very reasonable price and in a variety of cool colors. Patented bow-assist spring adds a boost of power! Although you may know Razor for their scooters, they’re the masterminds behind one of the more unique types of pogo sticks out there. The Razor BoGo Pogo Stick uses a patented bow-assisted spring, which allows you to get more bounce with less effort. When you land the bow bends and then helps push you upward, sending you higher. The BoGo is another versatile pogo stick; it can be used for tricks and flips, as well as by kids learning to bounce for the first time. The BoGo also has a lightweight, foldable frame, made from aircraft-grade aluminum, for durability and easy transportation. The bow-assisted spring also helps ensure a smoother bounce as you play. With a weight limit of 140 pounds, the BoGo isn’t really intended for adult users. It rings in at 45 inches tall and 8 pounds and comes in a variety of designs. CLASSIC TRICK POGO STICK: The Super Pogo is a classic pogo stick from Flybar meant for extreme jumping and technical pogo tricks but is always great for beginners who want to learn to pogo. Nothing beats a classic. 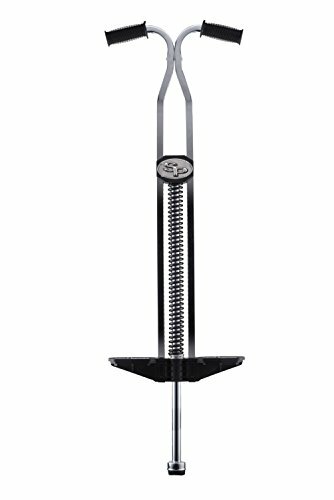 HEAVY DUTY METAL CONSTRUCTION: Strong spring powered pogo stick made of a heavy metal construction with reinforced injected-molded clamps and steps that will hold up for the most technical pogo tricks. The Flybar Super Pogo Stick gets rave reviews from its users, most of whom are adults! This mid-range pogo stick has the classic style that we know and love but is designed for use by beginners and advanced tricksters alike. It also has the distinction of coming from the original pogo stick company, Flybar. Although it has a classic look, the Super is built to be heavy duty, no-frills pogo stick, designed for quick jumping and technical tricks. Because the whole build is metal, the Super is one of the heavier pogo sticks out there and not really designed for getting altitude. It tends to be a little noisier than some of the other pogo sticks out there. It’s found popularity among older pogo stick enthusiasts who are looking for a simple tool for fun and fitness. The Super is aimed at kids 14 and up, but can be used by adults too, with a weight rating of 120-210 pounds. It’s 49 inches tall and weighs nearly 10.5 pounds. EXPERTLY DESIGNED POGO STICK: Combining the classic form for traditional bouncing with new-age function, the NSG Flight Pogo Stick is the choice for pogo jumpers everywhere! SPORT-LEVEL PERFORMANCE: Perfect for casual jumpers, but powerful and durable enough for aspiring Xpogo athletes looking for a higher bounce, flatland precision, and bigger air tricks. MATCHLESS FEATURES: Low Friction Spring Technology, hydro-formed steel shell, industrial-strength steel springs, steel piston, welded diamond footplate, and co-molded rubber grips. NOT JUST FOR KIDS: Jumping around is not just for little kids. Everyone can enjoy the fun and benefits of pogo-stick jumping; an intense, yet low-impact, cardio and plyometric exercise. SPECIFICATIONS: Color: Black. Height: 42 inches. Item weight: 6 lbs. Recommended for boys and girls ages 9 and up, weighting 80 lbs - 180 lbs. Overall dimensions: 11"L x 2.2"W x 42"H.
If you’re looking for a simple and affordable pogo stick, you can’t go wrong with the NSG Flight. It’s the most affordable pogo stick on this list and perfect if you’re looking for something for yourself or your kids to play with at the park or get your workout on while having a bit of fun, but not planning on doing any extreme tricks or looking to get too much air. The Flight is well-reviewed and great for the casual jumper looking to improve their fitness or children playing outside. It uses Low Friction Spring technology with industrial strength springs to give a smoother, quieter bounce that stands up reasonably well to wear and tear. For its price, the NSG Flight is one of the best options if you’re looking for a pogo stick on a budget. The Flight is 42 inches tall and weighs about six pounds. It’s intended for people over the age of nine, between 80 and 180 pounds. The most advanced pogo stick ever created! The smoothest pogo stick ride ever. This is arguably the most advanced pogo stick on the market. Consistently ranked and rated as the best, the Vurtego V4 Pro is a gamechanger in the pogo world. With the V4 line, Vurtego has scrapped traditional metal coil springs and opted for a revolutionary compressed air spring. This allows the V4 Pro to reach heights of over 10 feet. The V4 Pro is the stick of choice for professional Xpogo competitors. The air spring system also allows you to adjust the air pressure, and therefore the springiness, of your pogo stick. This means that the V4 can be adjusted for any weight (although Vurtego suggests you weigh at least 75 pounds to ride this ride), so the V4 is just as good for kids as it is for adults! It’s available in three different sizes and has a handy sizing chart on its website to help you choose the most appropriate pogo stick. The biggest downside to the V4 Pro is its price tag. It’s easy, and significantly, the most expensive pogo stick on the market. They offer a slightly cheaper version, the V4, which is designed for jumps of less than 5 feet (but can still go as high as 8 feet). Both pogo sticks are focused on recreating the experience of jumping on a trampoline – on the go! If you’re just starting out with your pogo stick, whether you’re five years old or fifty, it can be a little intimidating. There tons of great resources to get you started. Once you’ve picked out a pogo stick that is a good fit for you, you’ll need to find a good place to practice. If it’s your first time, practicing on firm, dry, grassy ground is a good idea. You want to make sure to start out on a level surface. We also recommend wearing a helmet! Stand your pogo stick up and put one foot on the footpeg and press down. This engages the spring. When you’re ready, place your remaining foot on the other footpeg and jump. Remember to keep the pogo stick shaft pulled towards you, rather than pushing it away. As soon as you’re comfortable bouncing in place, you can practice moving. All you have to do is tilt your pogo stick where you want to go and jump. Don’t worry if it’s tough at first. You can do it! An urban legend says that the man who patented the first pogo stick in America, George Hansburg, got the idea for making a jumping device with he was traveling in Burma when he met a little girl named Pogo. She would walk to a temple every day through the mud and he decided to create a tool for her to get to the temple without getting dirty. In actuality, pogo sticks were probably invented first in Germany, although where (and when) the very first pogo stick came from isn’t known exactly. When a shipment headed for Gimbel Bros. department store from Germany showed up rotted through, Hansburg was tasked with creating a stronger toy that could be sold. He replaced the wooden frames with metal and the pogo stick was patented in 1919. However, the version we’re familiar with, featuring handles rather than just the metal pole, wouldn’t be patented until the 1950’s. The pogo stick enjoyed huge popularity in the twenties, with the Ziegfeld Follies using them in a choreographed dance routine and children across the country enjoying their newfound toys. It faded from pop culture and resurfaced now and then as a fun, simple toy, without any major adjustments to its design. In the last twenty years, the technology behind pogo sticks has come a long way. Three different companies have revolutionized the technology behind this beloved childhood toy, moving beyond the simple springs we remember from our youth and on to higher tech and bigger bounces. Nowadays, innovators are creating pogo sticks which use lightweight air springs or adjustable elastomeric thrusters. Pogo sticks experienced a new surge in popularity as followers of “X-treme” sports began to experiment with how far they could push the boundaries of the pogo stick. Now, the Xpogo stunt team performs all over the world and hosts an extreme pogo competition, Pogopalooza, every year to see how much more they can get out of their pogo sticks. In addition to being a good time and a great activity for children and their friends, pogo sticks are a great form of exercise. When you bounce, you use your back and core to stabilize yourself, strengthening your back, toning your core. It also builds muscle in your legs and rear as you jump. They’re not just for children anymore. More pogo sticks are being designed and produced for adults, like the Vurtego V4. People of all ages are discovering the health benefits of bouncing on a pogo stick. One hour of bouncing can burn up to 600 calories, in addition to helping you improve your sense of balance! Whether you’re using a pogo stick as a toy for your kids, doing tricks and flips, or looking to go pro, your pogo stick will need some TLC to keep it running smoothly. If you’ve gone the Vurtego route, they have informational videos about caring for your pogo stick and keeping it in pristine condition. Lubricate, lubricate, lubricate! If your pogo stick uses a spring this is especially important for keeping it strong, smooth, and quiet. If you find that the rubber on the bottom of your pogo stick is wearing thin and the grip is starting to fail, you’ll need to pick up a new one. Most pogo stick brands offer replacement parts you can order. Flybar is the original pogo stick company. They produced the first pogo sticks in the 1920’s and haven’t stopped since, continuing to innovate and create new and improved pogo sticks. Flybar is the company behind the modern pogo stick as we know it, with a metal frame and handlebars. They’ve also created high-tech adjustable elastomeric thrusters to increase your bounce. Vurtego creates the highest performing pogo sticks on the market and it’s clear that they are passionate about what they do. This company pioneered the compressed air spring style of pogo stick which has allowed their pogo sticks to hold the records for highest jumps and most complicated tricks. Vurtego pogo sticks are the go-to for professional pogo stick jumpers. On their website, they have provided lots of in-depth videos to teach you everything from Pogo 101 to advanced tips and tricks. NSG designs simple and affordable pogo sticks. Their pogo sticks won the 2014 Top Toy of the Year Award from Creative Child Magazine. While NSG is not on the cutting edge of pogo stick technology, their toys are well built and great for the casual pogo stick user. Q: Is pogo sticking good exercise? A: Absolutely! You can burn up to 600 calories from an hour on a pogo stick and this can be split up throughout the day. It helps tone and firm up nearly every part of the body. Pogo sticks have the added bonus of being completely portable, so you can use them anywhere. Q: Are pogo sticks safe? A: As with anything, pogo sticks can be dangerous if used incorrectly or irresponsibly but there are steps you can take to ensure your safety. Make sure to use your pogo stick in safe locations and wear appropriate safety gear. This means wearing a helmet! 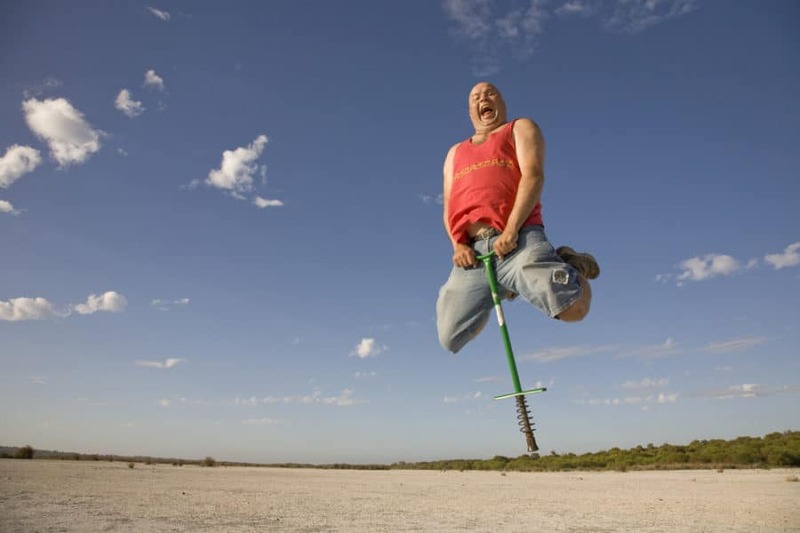 Q: What is the pogo stick world record? A: There are many different pogo stick world records! The highest recorded jump is 11 feet and ½ inch. The most consecutive jumps is 88,047. You can check out more pogo stick world records here! Q: What should I think about when looking for a pogo stick? What size pogo stick is right for you? It needs to be able to support your weight and not be too short lengthwise. What material is it made of? Pogo sticks are made out of different kinds of metals and with different kinds of protection. There are foam covered pogo sticks which are ideal for children and different types of metal for different levels of durability. What kind of pogo-sticking do you want to do? If you’re looking for some casual fun and fitness, you don’t need to get the best, most advanced pogo stick on the market. If you’re hoping to go pro, do cool flips, or jump really really high, you’ll need to get a more lightweight, more expensive pogo stick. If you’re looking for a top of the line pogo stick, it’s worth the extra money to get the Vurtego V4 over the Flybar 1000. It really is the pogo stick of the pros. If what you want is a toy to share with your children without breaking the bank, we recommend picking up an NSG pogo stick. No matter what you choose, you’ll discover (or rediscover) the fun of bouncing – and find your own fitness improved in the process! Looking for more fun things to do in your yard? Check out these swingsets and basketball courts!